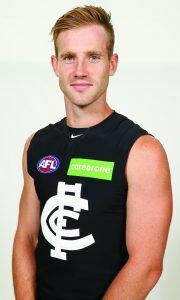 MDA is excited to announce that Carlton Football Club’s Nick Graham has joined the MDA team as an MDAmbassador. Nick grew up in Traralgon and has been playing with Carlton since 2013 and plays primarily as a midfielder. Nick put his hand up to volunteer his time and profile to assist MDA in raising our profile, awareness of MDA and MD and in turn, increase funding for the National Muscular Dystrophy Research Centre as well as MDA’s respite services and programs such as CampMDA. Since coming on board with MDA at the start of 2016, Nick has already organised visit for some of our biggest Carlton fans to training sessions and has visited our office to meet the team as well as being present to send off our ChallengeMD Goldfields bike riders in March and take pictures with some of our biggest Carlton fans from the Royal Children’s Hospital.